And then there were four. Yes, we are down to just four teams in the playoffs. And the four teams are the top two seeds in each conference. It normally doesn't play out this way in the NFL, but it has fallen this way this season. This should make for a highly entertaining Sunday of games. Well, it shows that way on paper. We know things haven't been great the first two week of the playoffs, but here is to hoping this week's games are top notch viewing. I know I'm excited. Now for my random thoughts for the week. . . . . It will be interesting to see what the Chiefs do at running back next season. Damien Williams is sure making it a hard decision for them. He just keeps getting it done as a starter and producing big in that role. He is a dual threat with great moves in the open field. Williams just seems a great fit for the offense. I wouldn't be surprised if they keep Williams as the starter and draft a back in the middle rounds to become the eventual starter. We'll see. It is amazing to see what good coaches can do with that extra week to prepare for a game. This was on full display last weekend, especially in New England and Kansas City. Those two offenses put on a clinic against their opponents. And both those defenses were much maligned throughout the season, but did a great job last week. It was quite the impressive display of game planning. You can underestimate the value of having a great coach in the NFL. I like the hiring of Adam Gase for the Jets. I think he'll be good for the development of Sam Darnold and that offense. Gase did do a few peculiar things in Miami while head coach, but he knows offense and has done well developing quarterbacks in the past. Darnold should continue to grow with Gase at the helm. One hire I'm not so sure about is Kliff Kingsbury going to the Cardinals. This seems a really risky hire for the Cardinals. Kingsbury had a losing record as a head coach in college and has no NFL coaching experience. He had some top offenses at Texas Tech, which is why the Cardinals went this direction. He is going to need to surround himself with some proven coaches on his staff if this is going to work. I really think this hire was a swing and a miss for Arizona, but I have been wrong before. We'll see. Another hire I wanted to mention, but didn't involve a head coach, was the hiring of Mike Munchak by the Broncos to be their offensive line coach. Munchak is considered the best offensive line coach in the game and done a great job with the Steelers the past few seasons. He gets a chance to coach up the Broncos unit and improve a running game that already was decent last year. This could really help the value of the entire offense of the Broncos going forward. And on the flipside, the Steelers lose a great coach, which could adversely impact that team's offense. So Kyler Murray declared for the NFL draft. It will be interesting to see where he gets picked. He obviously has a ton of talent, but his size (5-9) is going to hurt his stock. That is really small for an NFL quarterback. Plus, he was a top-10 pick in the MLB draft and could end up playing baseball instead. There is going to be a lot of talk swirling around Murray in the coming months. It should be fun to watch. News and Notes: The Eagles stated in their season-ending press conference Tuesday that Carson Wentz is the team's starting quarterback going forward. . . . .The status of Panthers quarterback Cam Newton is a bit up in the air. The team stated they aren't sure if he will need surgery on his shoulder or what a possible time recovery might be if he has surgery or doesn't have surgery. There were even reports Newton has a chance to sit out all of next year. Drew Brees, QB, Saints. 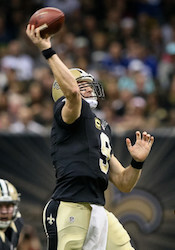 Brees did miss on some throws last week but had a solid game overall, throwing for 301 yards and two touchdowns in the Saints playoff opener. He has two straight 300-yard games. Brees is setup for big things this week, playing the Rams. He threw for 346 yards and four touchdowns against this same Rams team in Week 9. The Rams have been middle of the pack against the pass much of the season. Los Angeles allowed 31-passing touchdowns during the regular season. Sony Michel, RB, Patriots. Michel had a career high 129-rushing yards and three touchdowns last week. He has 100-yard games two of his last three. He also has at least 50-rushing yards seven straight games. The Patriots could have a similar game plan against the Chiefs this week, rushing the ball and using a short-passing attack. This bodes well for Michel, playing a rush defense that allowed the third most fantasy points to running backs during the regular season. Tyreek Hill, WR, Chiefs. Hill has three touchdowns his last two games and at least four receptions five straight games. He continues to get a workout on a weekly basis as the top receiver in the Chiefs potent passing game. Hill had his only three-touchdown game of the season against the Patriots in Week 6. You can expect him to get plenty of chances to make big plays in this one. He should do well against the Patriots, a team that was just 22nd against the pass during the regular season. Chris Hogan, WR, Patriots. Hogan was targeted five times last week but caught just three passes for 13 yards. If there is a positive for Hogan, it is he has 16 targets his last two games. He is getting more chances to make plays. The bad news is Hogan isn't making many plays with those chances. At this point, Phillip Dorsett is easier to trust than Hogan despite Hogan having a better track record overall. Jared Goff, QB, Rams. Goff has not played bad by any means down the stretch, but he hasn't been called on to do as much. He has fewer than 30-pass attempts three straight games. He also has fewer than 200-passing yards three of five. He is always capable of the big game in this offense, but you have to worry about him on the road in such a big game for the first time in his career. We wouldn't be surprised if he has some struggles this week, especially with the Saints defense playing much better than earlier in the year. Brandin Cooks, WR, Rams. Cooks is getting some decent reception totals lately, but his yardage numbers have been pretty poor down the stretch. He has 65 or fewer yards six straight games. The big game has been nonexistent for Cooks, which is normally his calling card. We aren't sure he suddenly emerges this week despite a favorable matchup. He could draw Marcus Lattimore in coverage, which wouldn't be a good thing for Cooks. Ted Ginn, WR, Saints. Ginn was on Injured Reserve much of the season because of a knee injury but returned late in the year. He has been a big part of the offense since his return, having eight receptions for 118 yards in two games. Ginn also has been targeted 15 times those two games, which is very encouraging. He might have the best matchup of the Saints receivers this week, getting the Rams No. 2 or 3 cornerback, so don't be surprised if the Saints exploit this favorable matchup. C.J. Anderson, RB, Rams. Unfortunately, we had Anderson on our cold list last week. He proved us wrong, continuing to get plenty of chances in the Rams suddenly run-heavy offense. It really looks like this is the formula for the Rams offense right now, dominating the line of scrimmage with a powerful running back. Anderson should get his chances even in a backup role. He has three straight 100-yard games and four touchdowns during that stretch. Remember, he led the Rams in rushing last week, producing better than starter Todd Gurley. Phillip Dorsett, WR, Patriots. Dorsett did little much of the season but is getting more chances this days, especially with Josh Gordon gone. He has touchdowns two straight and nine receptions in those two games. He is a good fit for the slot and can make plays with the ball in his hands. Dorsett is never a sure thing in this offense, but with Rob Gronkowski doing little right now, Dorsett could benefit with more targets. He is worth a flier for fantasy teams. Each week we will take a look at some of the high and low scoring games for the coming week. In high scoring affairs, get your marginal players on those teams in your lineup to take advantage of the possible points barrage. And in the low scoring games, keep those marginal players on the bench and make sure to have your defenses involved in those contests. High Scoring Games: Saints/Rams, Patriots/Chiefs. Jeff Paur is a two-time finalist for FSWA Fantasy Football Writer of the Year and won the FSWA award for Best Fantasy Football Article on the Web in 2011. He also was the most accurate expert in 2012, winning the FSTA Fantasy Football Accuracy Award. If you have any questions for Jeff, email him at jeff@rtsports.com. Follow Jeff on Twitter @jeffpaur.